Love Story, The Godfather, Chinatown, Rosemary’s Baby, The Odd Couple, Marathon Man, Harold and Maud…. How’s that for a list of classics? And to think that the man behind every one of them, the producer par excellence, started out as a p-grade actor in bombs like Kiss of Death and The Fiend Who Walked The West. 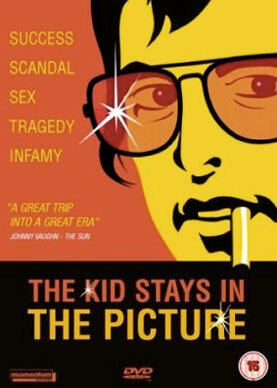 Black and white footage of the handsome young Robert Evans hamming it up as the ‘kooky killer’ pops up like some hilarious nightmare throughout The Kid Stays In The Picture, a riveting documentary on his truly extraordinary life,. The title is a line barked by Darryl Zanuck, the head honcho of Twentieth Century Fox, in response to a petition signed by Eva Gardner, Ernest Hemmingway and Jerome Power warning that if Evans were to play the role of the matador opposite Gardner in Hemmingway’s story The Sun Also Rises, it would be a disaster. The kid stayed but from that moment on he wanted to be the man who called the shots too, the next Darryl Zanuck, and before too long he was. By 1967, the pretty boy actor was running Paramount Studios, churning out hit after hit. He married Ali McGraw, or, as he calls her ‘Snot-nose’, the epitome of the 1970s flower child. He hired on Francis Ford Coppola to get the ‘smell of spaghetti’ out of The Godfather, and Roman Polannski to put the freakazoid factor into Rosemary’s Baby. But the further he climbed up the mountain, the bigger the fall became behind him. Luckily, when it did come, he had the likes of Jack Nicholson there to pick him up and get him back his beloved Beverly Hills home. Evans dished the dirt on every chapter of his action-filled life in his autobiography but it was the 8-hour audio version that clicked with Graydon Carter, the editor-in-chief of Vanity Fair and the documentary’s producer. Using a revolutionary technique of animating still images by separating the subjects from the background and shifting them in space, the archival material becomes a living illustration of the bumper-to-bumper narration by Evans himself. It’s hard to keep up with his gunfire delivery. As the credits roll Dustin Hoffman does his best Robert Evans impersonation, mumbling more movie madness for our delectation. This is an inspirational story of a Hollywood anti-hero who refused to get out of the picture. All power to him.